Poor old Zhou. He has a tremendous problem if he should be lossening monetary policy in the face of a runaway credit boom. The answer would be to deregulate interest rates and let the shadow banking/black market rate of 9% come down to meet the official rate that should go up. More than half the credit growth in China in the first five months was in the shadow banking sector, itself growing at 60%+ YoY, vs 15% in the official sector. A 25%+ Total Social Financing growth YTD is a lot for an economy growing at 10% NGDP to bear. What would you suggest Zhou should do given these additional facts? I think it is pretty simple – monetary policy should be focused on monetary matters. Chinese monetary policy is clearly becoming too tight and monetary easing is badly needed. I suspect that the credit boom is not necessarily a result of monetary policy, but rather a result of failed government planning, housing subsidies, implicit and explicit state guarantees and general problems with moral hazard. That needs to be taken care off by deregulation of the financial sector and a general freeing up of investment decisions. Many investments decisions in China is still massively distorted by direct or indirect government interference. Monetary policy cannot deal with these issues and if central bankers get themselves preoccupied with credit issues then it is pretty certain that the wrong decisions will be taken. I think PPT does not make sense in a such big and relative closed economy like China, but it would make sense in countries like Singapore, Sweden or Switzerland. 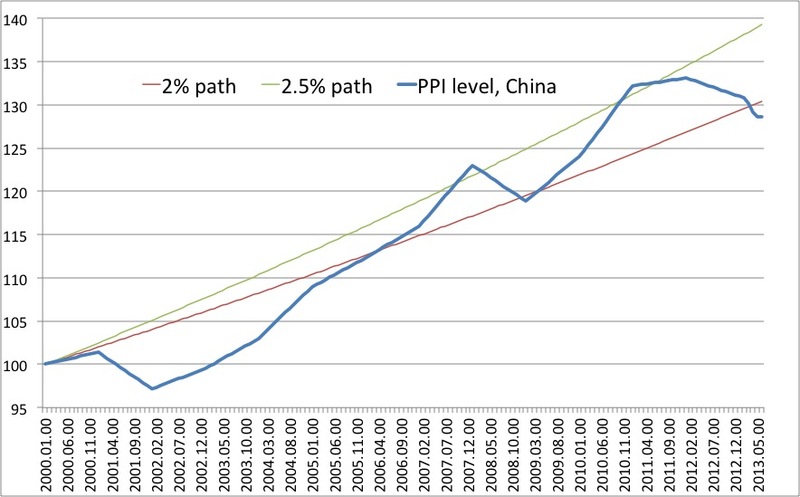 You got to understand the difference between PPI input (purchaser prices) and PPI output (producer prices) http://www.stats.gov.cn/english/pressrelease/t20130709_402909717.htm Then you understand that the whole y/y change was caused by cheaper purchases. Cheaper input prices are again caused weaker factor/commodity prices and the stronger yuan. On the other side, producer prices for consumer goods are unchanged y/y. With PPT you would question the whole transformation process of the Chinese economy. For more consumption, the bank needs weak inflation, 2.7% CPI is still quite high. Before Zhou Xiaochuan speaks to guys like Frankel or you, he should quickly check with party leader Xi Jinping, if he is allowed to listen what you guys say. Just one thing about “monetary tightening in early 2010”. For me the global recession took only one year from 2008 to 2009. Thanks to the Chinese government stimulus program the world economy could quickly expand again. PPI values of 5-6% in 2010 were justified when compared to the recession year 2009 with minus 7% PPI. Tightening in 2011 would have worked well if there was not “helicopter Ben” that was flooding the world with money in QE2 and causing the currency wars. Similar as Brazil’s Mantega, the PBoC should have tightened shortly after the QE2 announcement. But they were too optimistic and thought that QE2 would not drive up commodity prices excessively and with it the PPI to +6% and more in 2011.